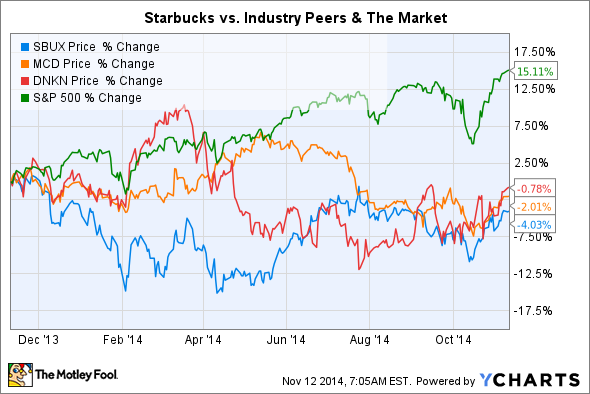 Starbucks stock has gone nowhere over the past year, and its dividend lags behind its industry rivals. But investors shouldn’t hold their breath for a much bigger dividend. Over the past year, investors probably haven't been happy with Starbucks (NASDAQ:SBUX) stock, which underperformed industry rivals McDonald's (NYSE:MCD) and Dunkin' Brands (NASDAQ:DNKN), as well as the overall market. To make matters worse, Starbucks' forward annual dividend yield of 1.6% looks paltry compared to McDonald's 3.6% and Dunkin's 2%. Investors might be wondering if Starbucks should pay a higher dividend to compensate for its stagnant price performance. Let's take a closer look at Starbucks' payout ratio, return on equity (ROE), and free cash flow (FCF) to see why that probably won't happen anytime soon. Starbucks earned $2.71 in fiscal 2014 and paid out $1.04 in dividends, giving it a payout ratio of 38%. At the end of the year, it raised its dividend 23% to $0.32 per share ($1.28 per year), which will equal a payout ratio between 36.2% and 37.4%, based on the company's anticipated 2015 earnings of $3.42 to $3.54 per share. Starbucks' two industry peers, McDonald's and Dunkin' Brands, respectively have higher trailing 12 month payout ratios of 64% and 57%. Starbucks also has an ROE of 42.4%, which is considerably higher than McDonalds' 35.1% but lower than Dunkin's 44.6%. A higher ROE means that a company is more efficient at turning shareholder money into profits, which gives it more leftover cash to pay dividends. Therefore, it would appear that Starbucks can afford to boost its payout ratio closer to McDonald's and Dunkin' Brands. However, a high ROE shouldn't always be associated with higher dividends. If a company is still growing rapidly, it should ideally reinvest all of its earnings back into expanding its business. Therefore, if Starbucks has better opportunities to use its cash than its industry peers, it probably shouldn't raise its dividend. To get a clearer picture of how Starbucks spends its cash, we should take a look at its FCF. In fiscal 2014, Starbucks paid out $783.1 million in dividends, but its FCF dropped to negative $553.1 million. Normally, dividend payments soaring higher than FCF would precede a dividend cut, but Starbucks' FCF was weighed down by a one time $2.8 billion litigation charge caused by its three-year legal dispute with Kraft Foods (UNKNOWN:KRFT.DL). Excluding that charge, Starbucks' FCF rose over the previous year, but it might not be reasonable to raise the payout ratio until FCF stabilizes again. Starbucks also needs cash to keep expanding across China, where it has nearly 1,400 stores. The company's short term goal is to open 1,500 stores across China by 2015. Starbucks also needs cash on hand to make business-enhancing acquisitions. For example, Starbucks acquired a tea business (Teavana) in 1999, a juice maker (Evolution Fresh) in 2011, a bakery (Bay Bread) in 2012, and recently announced the acquisition of the remaining 60.5% stake of Starbucks Japan (owned by Sazaby League) for $913.5 million. Over the past 12 months, Starbucks also bought back $618.9 million in stock. A Starbucks in Shanghai. Source: Wikimedia Commons. Therefore, raising the dividend could limit Starbucks' ability to expand, make deals, invest in new products (like VIA and Verismo), and boost buybacks. Despite Starbucks' lackluster price performance over the past year, its valuation ratios indicate that it is still a growth stock. The stock trades at 29 times trailing earnings, significantly higher than McDonald's and Dunkin's P/E respective ratios of 19 and 31. Starbucks' 5-year PEG ratio of 1.4 is also lower than McDonald's 3.5 and Dunkin's 1.8, which hints at stronger earnings growth ahead. According to traditional Wall Street logic, a company only raises its payout ratio considerably when price, sales, and earnings growth level out. But high valuations and analyst price targets (as high as $99 at Bernstein) suggest that investors expect Starbucks stock to keep rising. In my opinion, Starbucks shouldn't raise its dividend to match McDonald's or Dunkin' Brands' payout ratios yet. It has only paid a dividend since 2010, and the company's growth hasn't leveled off yet. For now, investors should keep an eye on Starbucks' annual dividend increases, and if it stays loyal to its stated plan of maintaining a payout ratio between 35% to 40%. Looking ahead, investors should pay close attention to Starbucks' China/Asia Pacific region, which posted the strongest comparables growth and operating margins out of its three global regions last quarter. That core growth engine could eventually help Starbucks soar to new highs over the next few years.